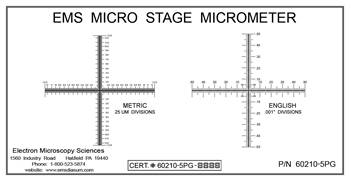 EMS is proud to add to our already extensive line -- a new wide range of Microscopy Calibration Standards and Standard Graticules, which are manufactured in the USA . This new line adheres to extremely tight tolerances and all of them are available with or without Secondary or Direct NIST certification. We offer Chrome-on-Glass (G) and Chrome-on-Opal glass (O) or Chrome-on Quartz (Q). The Opal and Quartz are offered as a special only and must be requested. All EMS micrometers come in a sturdy wooden box. Typical Uses: SM-3 is useful for calibration of magnification in microscopes and other optical magnification systems. Its auto-location features can be used for testing of an image analysis auto-location system. Same scale as SM-5, but smaller division. Glass Size: 1.5” x 3” (38mm x 75mm). Glass Size: 1” x 3” (25mm x 75mm). Typical Uses SM-12 is useful for calibration of magnification in microscopes and other optical magnification systems. We are proud to introduce the first complete and true line of Image Analysis Microscopy Calibration Standards, specially designed to address the current needs of the new generation of image analysis and machine vision systems. These unique standards are designed to test multiple morphometric parameters to assure that your image analysis system is working properly; meeting the required calibration and certification requirements of your vision measurement systems. We offer Chrome-on-Glass (G) and Chrome-on-Opal glass (O) or Chrome on Quartz (Q). The Opal and Quartz are offered by request only as a custom. 4 1000 x 800 µm Various Shapes, Circles, Bars & Angular designs. 5 1000 x 800 µm Squares – 100, 40, 20 µm set of 2 each. Based on the IAM-1 Morphometric Image Analysis above, the IAM-MET is a multi-morphology calibration standard designed specifically for ASTM. The IAM-MET includes all plates as found in IAM-1 except for plate 4, which is pictured above. This plate contains 9 images of irregular shapes, simulating features commonly found in metallurgical applications. As required by the ASTM standard, the IAM-MET includes secondary certification of plates 1, 2 and 8. Image: Chrome on glass / positive. Calibrated 32 points. A dual axis linear micrometer that can accurately calibrate both X & Y directions without rotation, for optical magnification, and camera aspect ratio using single standard. In addition, it can be used to calibrate and check linear stage motion or related auto measuring systems. Scales are in both English and Metric measurements. This ideal standard is for verifying or qualifying multiple image analysis parameters such as optical distortion, alignment between systems or optical paths, and cell areas for particle counting. The image area is 20mm x 50mm. A uniqulye designed standard with 4 different grid size patterns: 0.5 x 0.5 mm grid with 25 µm pitch; 1.0 x 1.0 mm grid with 50 µm pitch; 2.0 x 2.0 grid with 100 µm pith; and 4.0 x 4.0 mm grid with 200 µm pitch. Also includes a Star Target with 15 degree angle increments. This standard can be used to test not only the overall frame distortion issue, but also linear distances for a wide variety of magnification ranges from 1x to 1000x power. This ideal standard provides accurate calibration of any eyepiece, reticules, filar micrometers, or electronic measuring instrument. Features a series of ‘H’ shaped fiducial images in a range of sizes from 0.1 mm through 20 mm, useful for calibration range from 1X to 1000X power. Opal glass (O) is available per request. Typical Use: Verification or calibration of magnification.